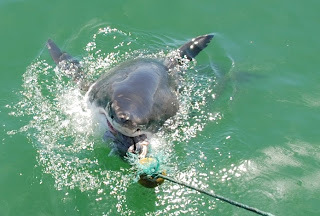 Today I went Great White Shark cage diving. The day kicked-off at 5.30a with a 2 hr drive to the town of Gansbaai, South Africa. Then an hour boat ride out to Shark Alley, a narrow channel between Dyer Island and Geyser Rock. There are thousands of seals in this area and thus the sharks are plentiful. Summer in South Africa is the low season for sharks - but we still got to see 3 Great White sharks this afternoon, up close and personal. I was in the first group to jump into the cage and I saw one shark pass by very close several times. But my next turn in the cage made the trip completely worth it. Three sharks were swimming all around us - in front, in back and below - and they came right up to the cage as they were eating the shark bait on the line - several times portions of their fins were actually in the cage with us. My face was less than a foot away from them! It was a really cool experience to witness them in the wild in their natural environment. I highly recommend this to anyone curious about sharks - this means you Kraham, as well as you Wyatt - once you get a tad older. I once rode on a bicycle past a rattle snake...almost hit it! Yeah, not quite the same. This is an awesome experience. I guess you could tell if you pee'd your diving suit or not. Did you touch one? Was the boat captain a crotchety old man and did he tell the story of delivering the bomb?